Altitude Junkies offer one of the most cost-effective full-service expeditions on Cholatse in the Khumbu region of the Nepalese Himalaya. 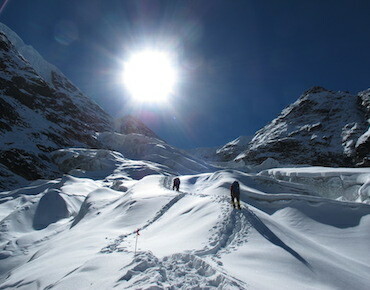 Our expedition is limited to six climbers and one expedition leader with four Sherpa to assist the expedition. 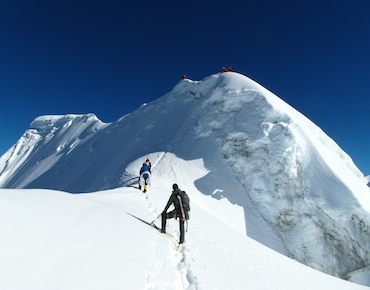 Due to the technical nature of this climb we have a higher Sherpa to climber ratio than most other 6,000-meter plus peaks. Cholaste is a step up in technical difficulty over Ama Dablam, therefore there are less teams present. 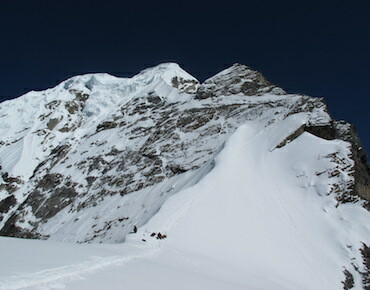 Unlike the Dablam, Cholatse is climbed prominently on snow and ice with a small section of rock lower down on the route. Himalayan veteran expedition organizer Phil Crampton who has reached the summit of Cholatse several times and has multiple summits on 7,000 and 8,000-meter peaks in Nepal, Pakistan and Tibet will lead the 2017 expedition and this will be his sixtieth plus Himalayan expedition. In addition to an experienced leader, the teams head climbing Sherpa Sirdar will be Pasang Ongcho Sherpa who holds the coveted UIAGM guide certification. Pasang has vast experience being a Sirdar on Everest, Lhotse Makalu, Manaslu and Cholatse and will be directing our climbing Sherpas who have all summitted 8,000-meter peaks before, some multiple times, and their knowledge of the mountains of Nepal is unrivaled. We utilize helicopters from Kathmandu flying directly to Namche Bazar. The Lukla fixed-wing flights are very weather dependent and we believe helicopters are a safer option. Namche Bazar is a good elevation to start the trek to base camp from. At the conclusion of the expedition we will take helicopter flights directly from base camp back to Kathmandu. After arriving at Namche by helicopter we will start the three day trek to base camp. Each evening we will stay in the best teahouse lodges on route and our kitchen staff will supervise all food preparation in the lodge kitchens. We will take cautious acclimatization rest days at Namche Bazar. 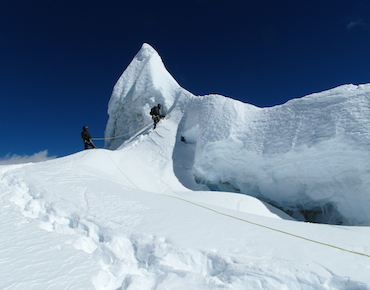 Cholatse is a technical peak and the expedition will place fixed ropes where necessary for the safety of all the climbers and staff. We have allocated 14 days at base camp and above to allow ample time for rope fixing as well as contingency days in case we experience bad weather. The route will see us navigate a small icefall that leads lead us to a possible small rock section, depending on snow coverage, that will have fixed rope in place. This will then lead us up a long snow and ice arete staying on the Southwest Ridge in its entire length to the summit. 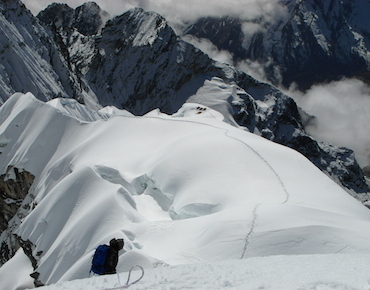 We will utilize only one camp on the mountain, camp one at 5,700 meters. We provide medical oxygen, portable altitude chambers and comprehensive medical chests at base camp. We also ask that all climbers carry individual micro high altitude medical kits at all times above base camp as the Sherpas and leader does. 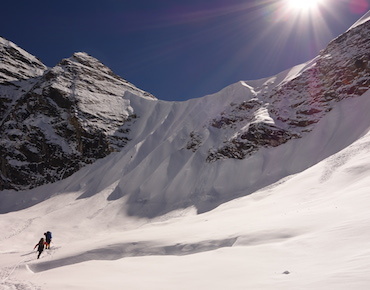 All climbing members and climbing Sherpas wear a personal avalanche beacon above base camp. Photo credits: Brad Jackson - Cholatse.